Chairman/Chief Executive Officer of Air Peace, Mr. Allen Onyema has said the carrier is championing seamless air connectivity in Africa to ensure the economic growth of the continent and ease the travel challenges of the people. Onyema spoke during the launch of Air Peace’s flights from Abuja, Lagos and Accra to Monrovia, Liberia and from Abuja to Accra, Ghana on Monday. The Air Peace boss insisted that the carrier had continued to prove its mettle in the project to link African nations and connect them with the rest of the world through flights to Accra, Freetown, Banjul, Dakar and Monrovia. 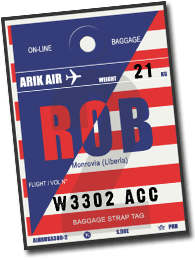 Addition of Monrovia to Air Peace’s route network, he assured, would consolidate the airline’s strategy to unlock economies in Africa through air connectivity. Onyema, who was represented by the carrier’s Corporate Communications Manager, Mr. Chris Iwarah said the carrier was gradually rewriting the negative narrative about regional flight operations in West Africa. The launch of the airline’s Monrovia service, he said, had expanded its regional operations to five routes. ”Today’s epoch-making event is a pleasing consolidation of our efforts to unlock the economies of Africa, offer air travellers on business and leisure trips seamless connectivity as well as create jobs for people,” Onyema enthused. Speaking on the carrier’s rapid expansion on the West Coast of Africa, he said: ”We began our intervention in the air travel difficulties of the West Coast of Africa with the inauguration of Lagos-Accra service in February 2017. A year later in 2018, we deepened our presence in the region with the addition of Freetown, Banjul and Dakar to our route network. “The addition of Monrovia to our route network is a fitting response to the yearnings of the flying public for the Air Peace experience. The launch of Monrovia brings our regional destinations to five. We are connecting Monrovia from Abuja and Lagos through Accra. Shortly, we hope to add more destinations to our regional route map. “Our goal is to build a solid base to link African nation’s and connect the continent to the rest of the world by air. With our expanded fleet of 24aircraft comprising Boeing 737, 777; Embraer 145 and Dornier Jets, we are set to soon begin flights to many international destinations including Dubai, Sharjah, Guangzhou- China, London, Houson, Mumbai and South Africa. There is no doubt we mean business at Air Peace.” For her part, Deputy Managing Director for Technical Services, Liberia Airport Authority, Paula Fares Harvey congratulated Air Peace on its commencement of Monrovia flights. The launch, she added, was a great milestone in Air Peace’s effort to connect Africa by air. ”It’s good for you, it’s good for us in Liberia at this time,” Harvey said shortly after the flight landed at the Roberts International Airport, Monrovia at about 12.15 p.m. (local time) to a rousing water salute and warm welcome by aviation authorities, airport workers and corporate executives. The International Terminal Manager of the Nnamdi Azikiwe International Airport, Abuja, Mrs. H. O. Musa also commended the airline for the launch of its Monrovia service. She spoke shortly after the flight returned to another round of water salute at the airport, predicting that the airline’s first regional flight out of the facility would be a success.